If you would ever need that small line to woo your loved one perfectly and ever fall short of words (Damn! You would never want that to happen) just have a look down at our 51 Best Dating Quotes to make her heart melt out for you. 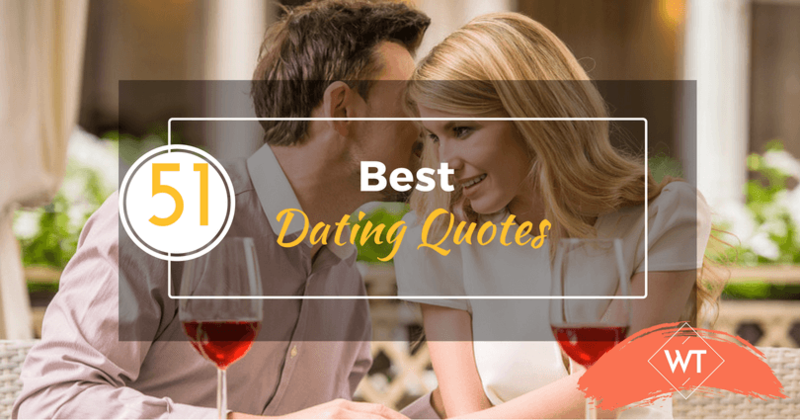 Here are the 51 best dating quotes by Wisdom Times, with an intention to help you lure your loved one with as much love as possible and let their heart fall for you and only you. (happily brought to you by Wisdom Times). This one’s the sweetest among the dating quotes! Not all dates end well. Get this dating quote straight. Now that you are in the dating stage, it won’t take longer for you to get into a serious and committed relationship. Committing yourself for a serious relationship requires a lot of self-introspection and respect towards the relationship and your partner. Take Wisdom Times’ QUIZ ‘Am I Ready For A Serious Relationship‘ to get a clear answer on whether you are ready or not to put yourself out there. Whether you are just into a new relationship or in a long-term relationship, reminding your partner of how much you love them again and again is the best way to foster love and keep that bonding intact. So pick anyone from our 51 best dating quotes, be chivalrous, present it in front of her with much elegance and sincerity and then let your soulmate melt in your arms.